Avery Harrison with her husband, Ben, and daughter, Corrine, in 2014. Moms cling to the precious moments they have with their children. For mothers living with metastatic breast cancer, those moments are more fleeting and treasured. Susan G. Komen® Colorado conducted an interview with Avery Harrison via email. Avery, who lives with MBC, finds it easier these days to type out her thoughts. She shares this look into her daily life as a mom living with stage IV breast cancer. 7:30 a.m. – Goodbye kisses. Back to bed. In 2014, 38-year-old Avery Harrison went for a regular check-up at her OB/GYN office. It was during that appointment that Avery’s doctor told her she might have a clogged milk duct. She had recently been pregnant. Her daughter, Corrine, who she calls CC, was two years old at the time. Avery’s doctor scheduled a mammogram to have the lump checked out. The days that followed are a blur. Avery had an MRI. Then a CT scan. Those tests proved what doctors had suspected: Avery’s breast cancer had spread beyond the breast. 8:30 a.m. – Take clinical trial drug. Go back to sleep. Avery’s cancer had begun in her left breast, then spread to her right breast. It had metastasized to her liver, hip, and spine. About six percent of breast cancer patients have metastatic breast cancer, or stage IV, when they are first diagnosed with the disease. Many times, metastatic breast cancer returns months or years after someone has completed treatment for early or locally advanced breast cancer. It’s estimated that about 154,000 people live with metastatic breast cancer in the U.S.
After Avery was diagnosed with metastatic disease, she had a whirlwind of consultations with oncologists about what to expect during treatment, which included chemotherapy, Herceptin, and Perjeta. “I continued to work fulltime [and had] my infusions later in the afternoon so that I wouldn’t miss work,” Avery says. 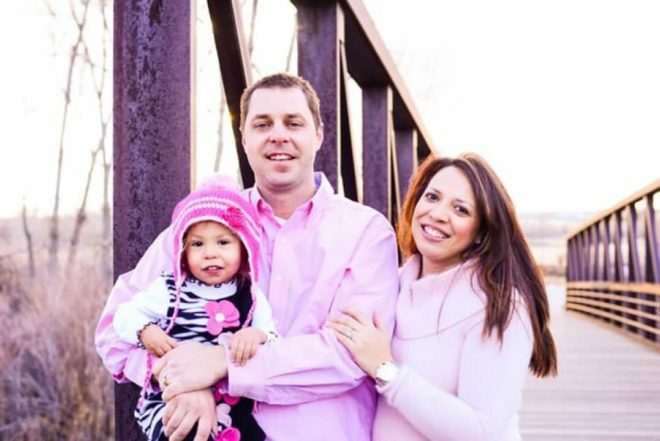 Avery and her husband, Ben Harrison, a 2018 Susan G. Komen Colorado Pink Tie Guy, explained to their two year old, as best they could, that mommy was very sick. Avery read books to Corrine about having cancer and losing one’s hair. Ben and Avery involved Corrine in the process. Ben took Corrine to pick up Avery from her treatments. “CC became very close with my infusion nurse,” Avery says. And when the treatments stole Avery’s energy, Corrine tried to comfort her. The treatments, though, seemed to pay off. In 2015, Doctors told Avery there was no evidence of disease, or what physicians and patients refer to as NED. She remained healthy and NED throughout most of that year. Then she began to have strange symptoms. “I started having what I thought was a sinus infection because for brief moments I experienced ‘whoosh, whoosh,’ like I was stuck in a wind tunnel, in my head,” Harrison recalled. The sensations continued into January 2016 when she was finally went to the emergency department after antibiotics did not clear up the symptoms. “The ER doctor came in to show [me] the multiple (12) tumors in my brain,” Harrison says. 10:00 a.m. – Begin errands and chores. Her doctor offered Avery chemotherapy again, but she wasn’t satisfied with that route. She wanted to know all treatment options available to her. So she sought a second opinion, and a new doctor’s regime included clinical trials. About a third of metastatic breast cancer patients will live at least five years beyond their diagnosis. Some women may live 10 years or more after being diagnosed with metastatic disease. For these patients, clinical trials provide the chance to try new treatments and possibly benefit from them. Whether a new therapy becomes part of standard treatment largely depends on clinical trial results. Hormone therapies and Herceptin are now standard breast cancer treatment after clinical trials showed their benefit. Avery’s second diagnosis was a blow to the Harrison family. But she was ready to continue the fight, which included a clinical trial, radiation, chemo, and brain surgery. This time, Avery chose to involve Corrine less in the treatment process. “I’ve made it a point not to bring her to the hospital this go round. Some say I’m doing a disservice to her, but I believe I’m letting her enjoy being a kid and not having to worry about her mom,” Avery writes. If Corrine asks, though, Avery is honest with her. But she says Corrine rarely asks about the cancer. “Instead, [she] asks if I don’t feel well. On my bad days she will snuggle with me and we’ll put on a movie. I usually fall asleep pretty quick and she’ll just be my baby and let me hold her,” Avery says. 3:00 – 6:00 p.m. – Family time. Dinner. Avery’s Family Medical Sick Leave, sick leave, vacation, and short-term disability have all been exhausted. For this, she’s glad. “It gives me the chance to be a stay-at-home mom and eliminates the extra stress of my job,” Avery says. Metastatic breast cancer has prompted a sense of urgency in Avery. She bought a cabin so she and her family can get away and spend as much time together as possible. She focuses on her relationship with her daughter, and tries to laugh a lot with Corrine who helps motivate her. 7:00 – 8:30 p.m. – Take Clinical trial med. Help with bath time. While Avery tries to focus on the good days, she has planned for the possibility one day she will not be with her daughter. She has written Corrine letters she can read in the future. And Avery has wants some of her cremated remained to be formed into a jeweled heirloom for daughter. Avery continues to be a part of clinical trials, and she has infusions every three weeks. When one treatment ceases to work, her doctor finds another trial. She recently was placed in a new trial after her speech began to slur. “Having a positive outlook on life helps me stay strong and want to fight to be around for many more fun days with Ben and CC,” Avery says. This Mother’s Day, Avery hopes she is well enough to make a trip to the family cabin.